One of the most iconic species of summer in the northern forest, the common loon beckons admiration, from wooden carvings, gift shop trinkets, ring tones, and paintings. For those spending a vacation around a campfire in northern Wisconsin, loons lay the soundtrack in equal parts to the campfire. The Journal Sentinel has developed a map where you can draw your own line for where “up north” is located; most agree, it follows a line a little north of Green Bay west to about Chippewa Falls. Over the course of the year, loons will move through southern Wisconsin, typically occupying larger bodies of water along the way. Lake Mendota in Madison and Rock Lake in Lake Mills are two excellent spots to view the common loon right now as it migrates through the area. During migration, loons with tracking devices have been recorded on dives of 174 feet. If you see any loons on Lake Mendota this spring, imagine the deep hole between Picnic Point and Maple Bluff. That’s 82 feet deep, so loons can dive to depths of more than two Lake Mendota’s! Listen to the calls of the common loon, and watch how it deftly dives and swims underwater. Video by BR Valley. Historical accounts indicate that loons did nest in parts of southern Wisconsin. 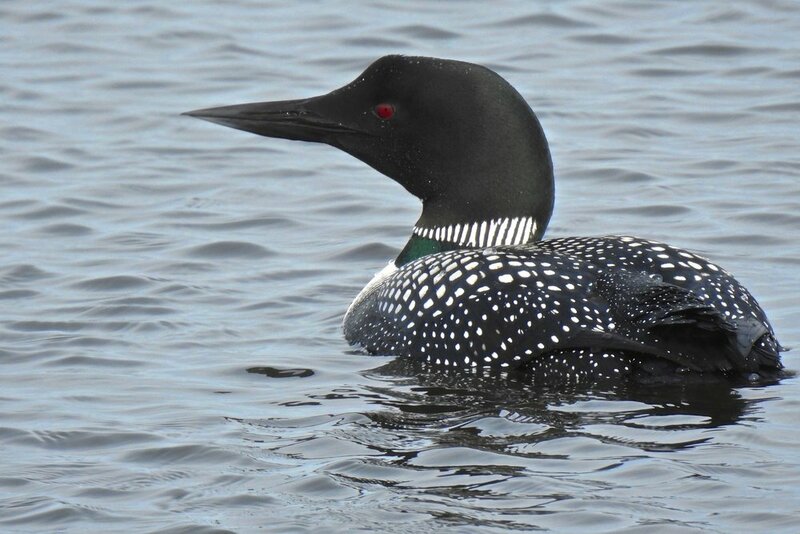 A number of factors conspired to limit the loon’s range to the northern expanse of Wisconsin, including wetland loss and degradation, mercury bioaccumulation, and lead poisoning. Loons nest within a few feet of the water, and wetlands at the edge of lakes are critical to nesting success. A common spot for loon nests is on the floating sphagnum mat at the edge of relatively acidic lakes in northern Wisconsin. Unfortunately for loons, lakefront development can negatively impact the ability to nest. Researchers have found that development of housing greater than 25 buildings per kilometer of shoreline prevents loons from nesting in the area. Housing development usually leads to the degradation or elimination of wetland habitat along shorelines. It doesn’t need to be this way. Many alternatives to a barren lawn exist that beautify the yard and add habitat for wildlife, and protect the erosion into the lake. You can find numerous excellent examples here. 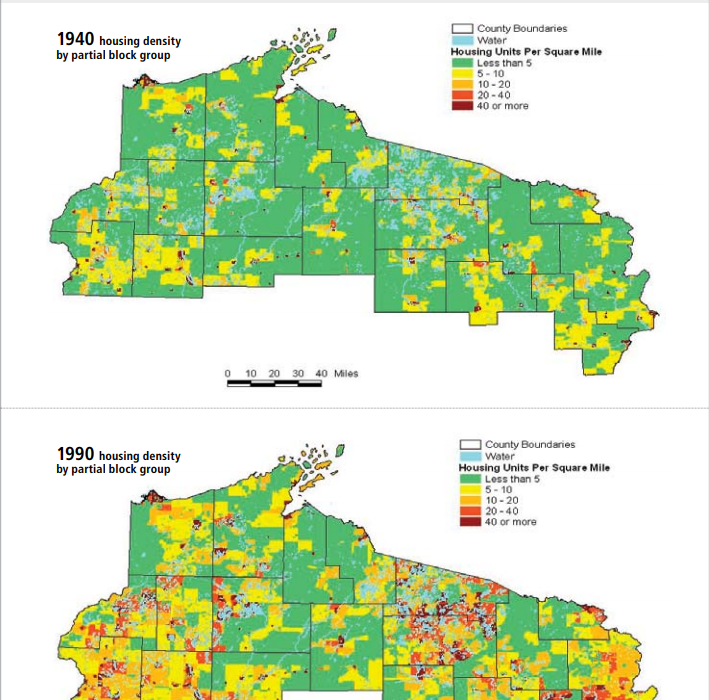 The map below is from the USDA Forest Service’s North Central Research Station and shows how housing density has increased in northern Wisconsin since 1940. Having the pleasure of loons on your lake can come with a number of responsibilities. Known nesting sites should not be disturbed during the summer. If there are known nesting sites, efforts should be made to reduce wake in those areas. Additionally, lead fishing tackle contributes to significant mortality each season. In Minnesota, one study found that 15-20% of dead loons had lead poisoning. Using non-lead alternatives is good for loons and the whole ecosystem. One of the biggest items on Wisconsin’s Conservation Congress hearings this past week was a ban on lead tackle and ammunition. 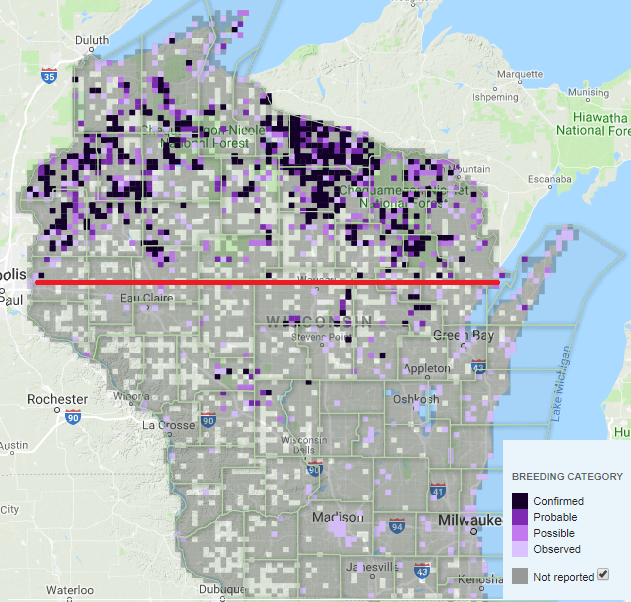 This would have positive impacts for the loon population, and it is estimated that a lead ban would save over 50 loons in Wisconsin each year. An issue outside of a loon enthusiast’s direct control is the emission of mercury from coal-generated power plants. As stated before, loons are sensitive to the bioaccumulation of methyl mercury because they are high in the food chain, long lived, fish-eaters, and nest on acidic lakes, which tend to have higher availability of mercury to move up the food chain (pictured below). A new EPA proposal would roll back some limits on emissions of mercury for coal-burning power plants. This could have a huge effect on public health, and different accounting estimates calculate the potential indirect benefit of saving thousands of lives due to the “co-benefit” of also decreasing particulate matter linked to lung and heart disease. In Wisconsin, coal-burning power plants have been granted exceptions for mercury emissions. Beyond public health, mercury for loons spells trouble. As mercury increases, hatching rates decrease beyond a sustainable number. With high mercury concentrations in the food chain, adults become lethargic and might not reproduce at all. This decreases the likelihood of success for the common loon, which already faces difficult enough odds on its breeding grounds where approximately 50% of nests fail, due to predation, flooding, or other causes. Another twist might occur as the climate continues to change. With flooding more likely, the amount of mercury in aquatic systems may also increase. Research from UW-Madison’s Center for Limnology has found an interesting correlation between annual water levels and the concentration of mercury in walleye. You can see that interesting blog post here. With flooding and high water levels, loons may be even more susceptible to mercury bioaccumulation. While fragile, the outlook for loons in Wisconsin is rather positive. Since 1980, the population has nearly doubled and continues to increase. If you’re able to help, you can sign up for Northland College’s Loonwatch, which aids research in a number of areas. Meyer, Mike. 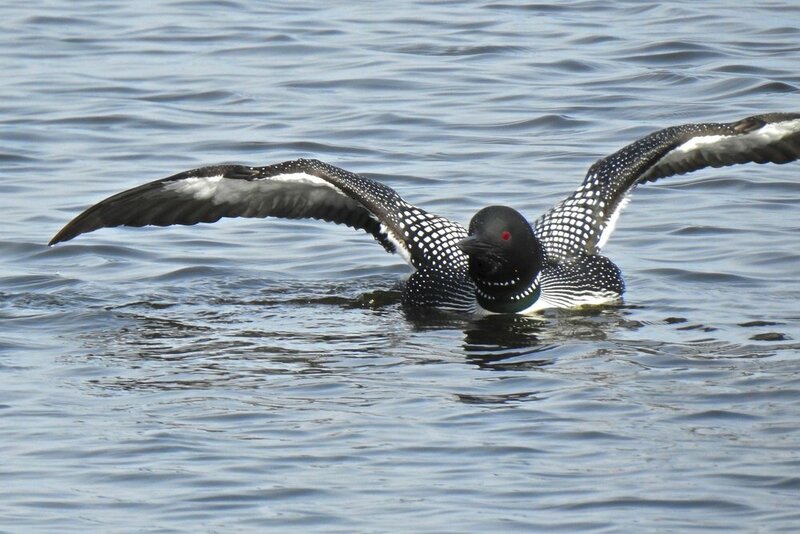 "Twenty Four Years of Common Loon Research in Wisconsin." Microsoft PowerPoint file. Accessed here.